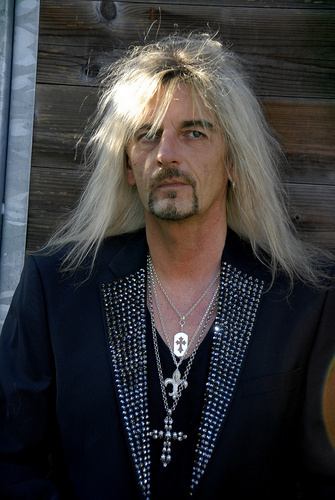 Axel Rudi Pell’s new album ‘Into The Storm’ hit the German charts at number five and in Switzerland at number nine. These are the highest entries ever in those countries in his 25 years long solo career. This result is well deserved for this fifteenth studio album of the bland German. Recently we had a debonair interview with the star guitarist about past, present and future. 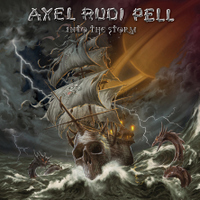 Axel you have already a long term career as solo artist, but now your fifteenth solo album ‘Into The Storm’ comes out and it marks the twenty fifth year in your solo career. That is quite exceptional for an artist. Are you going to do something special to celebrate this? Yes, we will do a special show on the eleventh of July on the Bang Your Head festival in Germany. 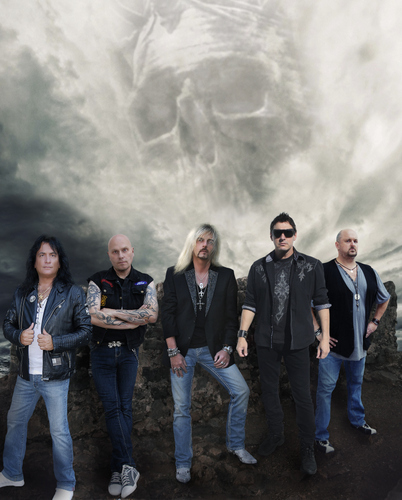 We will headline that evening and the event is called Axel Rudi Pell & Friends. We will play a few songs with this new current ARP line-up, then we have a small Steeler reunion, the band in which I used to play in the eighties. We will do a thirty-five minutes set. We try to get all the original ARP singers on stage too: that means Jeff Scott Solo, Charlie Huhn and Bob Rock performing with us and then we will have some musician friends on stage for jamming a bit and doing cover songs. I think it will be a nice evening. Hopefully. Exactly. The cameras will be there definitely (laughs). The new album comes two years after the previous one ‘Circle Of The Oath’. When you look back at the former one, did it come up to your expectations concerning the gigs you could play and the receiving by the audience? Yes, absolutely. I am nothing but amazed you know. We did tours in Germany and whole Europe. It was well organized and the audience loved it. Of course we had a couple of shows where not so many people showed up, but that is on every tour. On the other hand we had some people saying: It is another great album, but it is not the best album. After two years touring with ‘Circle Of The Oath’, I have to say I like the new one better. I don’t know why, but the songs are a little bit better and the production is better. We got some new blood inside the band: we got a new drummer. Everything is better I would say. Exactly. I think the same. Yes, me too, but unfortunately we cannot play them all live, because then we have to play six hours or so (laughs). Was there something special that inspired you this time when facing the writing process? No, because I have to tell you I write constantly. I am not stopping writing music. I am not sitting there, saying: now I have to write a record. That would not work for me. I cannot write when someone says I have to write. I am always collecting little ideas, for example when we went to the studio to record the rhythm guitars, I sat there in the studio together with my co-producer and engineer Charlie (Bauerfeind – Vera) and I just made some noise on the guitar to get the right sound and suddenly a riff came to my mind. I said: wow, that’s pretty cool, but I capture this idea for the next album. So I am writing every now and then every day. The magic has to be there. 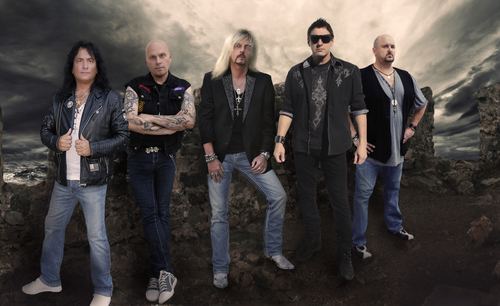 The band has a very solid line-up, but now after fifteen years a line-up change occurred: drummer Mike Terrana left. What happened? It is very easy to explain. Mike told me that he is not available for any live shows in 2014, because he has so many projects. Then he is on the road with Tarja and he has a new band, he has so many drum clinics. He cannot do it all at the same time. I had to say: well, when you cannot do the tour in 2014, we cannot carry on, because I do not want to present a new drummer only on the road. We do not have the time for that. I preferred to have a new drummer in, doing the record and the tour. So I got Bobby (Rondinelli – Vera) and I am very lucky with him. That is a famous guy as well! Indeed, he played with Black Sabbath, Rainbow and Doro and many more. How did you get in contact with Bobby? You all live very far away from each other. How do you make that work in a practical situation? We live in different parts of the world; that is why we do not see each other so often. That is great, I like it that way. Johnny is on the East Coast of America, Bobby too. Ferdy lives in another town in Germany… that’s great, because if you see each other too much, you drive each other nuts. Now we are having fun coming back together after a period of several months or a year into the rehearsal room for practising. We only do it for three or four days maximum. That is okay. Otherwise it would be boring if we would see each other three or four times a week and go then to the rehearsal room. That would not work after such a long time, fifteen years. When we enter the tour bus it feels like holidays together. We have so much fun on the road, always telling jokes and stuff. Of course we talk serious too, but only about the shows. What can you mention as memorable moments on all these tours? (thinks) I remember the worst show we have ever played. I think that was a couple of years ago, when we played at the Bang Your Head festival in Germany. There was a thunder and rain storm at that day and the complete festival area was covered with water and mud. It rained so hard! When we were on stage and the promoter told us before: you are only allowed to play twenty minutes, because all the other bands were cut short too. We played and the power went on and off, my guitar equipment failed, I could not use some effects, the microphone did not work properly… it was a kind of strange situation. It is eight or nine years ago, but definitely the worst show we have ever played. You are living in Bochum and that area is known for many concerts. What was the first show you attended? The very first show I ever saw was actually a festival here in my hometown Bochum. It was at the small river called the Ruhr. I saw UFO with Michael Schenker for the first time there and that was July 1974. Around that time was also a gig in Dortmund when I saw Scorpions with Uli Jon Roth and Rainbow with Dio. Great! I know you are a huge fan of Ritchie Blackmore, but did you ever meet him personally? I know your lyrics are always fantasy, but is there something more to tell about them this time? No, I always write fantasy, there is no story on the album and it is only fictional. I never write about my life or the life of other people, because most of all I want to entertain people with my stuff. Nothing more to say, except that it is mystical and the creatures are looking for new adventures so to speak. They are on the road and travelling to different universes and planets, trying to get rid of the evil. Yes, originally the ideas for all artwork are coming from myself. I have a very good guy who can paint it perfectly. This time we have an English guy Martin McKenna, who actually did all the artwork for the last four albums. I really like the outcome. I told him I wanted a kind of ghost ship with a skull on top, stormy sea and little monsters on it. I was really amazed when seeing what came out of this. It is incredible. It looked better than I expected it to be. Absolutely perfect. A remarkable cover is ‘Hey Hey My My’ from Neil Young. Why this choice? That is very easy to explain. Do you know the TV series Sons of Anarchy? It is a US series about a biker’s club. It is actually very famous here. I saw it on TV and in season three in the last episode, there is another cover version from ‘Hey Hey My My’ from an artist called Battleme. I liked it, but it was very short with only vocals and piano. This was cool. I thought it was a great idea to make a ballad of this old Neil Young classic. Of course I rearranged it a bit to fit the ARP style, so we made our own version of it. I really love that track now. I think, as far as I remember, when I saw Deep Purple performing on TV. I was eleven years old and I think I got my first real guitar on my twelfth birthday. I started to learn how to play and that took me a couple of years. I think I played my first show was in 1974. I got my own band and we played in the youth club down in the cellar. We were really bad at that time, but these were my first steps into the music business. Soon you will be on the road again. So please tell me about your plans for this year? We start very soon with the tour as you said. From the seventh of February on we will do a couple of shows, but it is only the first part of the tour. In Summer we do the Bang Your Head festival and then we carry on with the tour in September and October. Maybe there will be a third part of the tour, but we have to wait for the response on the first two legs of the tour.